U.S. Naval Academy Museum: The Museum houses a collection of more than 35,000 items including paintings, prints, and naval history artifacts. The museum also features the Class of 1951 Gallery of Ships, featuring bone, gold, and wood ship models made by world-class artists. Some of these date back to the 17th century. 118 Maryland Avenue, 410-293-2108. Nautical Destinations: Nautical Destinations offers customized yacht charters and unique special events for groups visiting Annapolis, Baltimore and Maryland’s Eastern Shore; sail, power, small, and large. 105 Eastern Avenue, Suite 101, 410-269-4213. Admiral of the Bay, LLC: Event planners for the Chesapeake Bay for groups of two to 250. Schooners and custom power yachts are perfect for weddings, business meetings, lunch or dinner sunset cruises. Offering crab feasts or formal dining. 222 Severn Avenue, 410-263-5196. Annapolis Powerboat School: All hands-on, on-the-water instruction. Two days of basic boat handling and five days of cruising courses to unique waterfront inns. Private instruction is available on your boat or the school’s. 601 Sixth Street, 410-267-7205. Annapolis Sailing School: America’s oldest and largest sailing school teaches students to sail the “Annapolis Way” from beginner to advanced. Also offering the KidShip Sailing School, a children-only sailing program. Boat rentals are also available. 601 Sixth Street, 410-267-7205. Annapolis Opera: Maryland Hall for Arts, 801 Chase Street, 410-267-8135. Annapolis Summer Garden Theatre: This 200-seat, outdoor community theatre presents Broadway musicals and Shakespearean comedies on Thursday through Sunday evenings from Memorial Day to Labor Day. 143 Compromise Street, 410-268-9212. Annapolis Symphony Orchestra: Offering music lovers the finest classical repertoire played by professional players. 801 Chase Street, 410-269-1132. Ballet Theatre of Maryland: This professional dance company offers ballet productions (classical and modern); lectures; demonstrations; and dance instruction. Most performances are held at Maryland Hall. 801 Chase Street, 410-263-8289. Chesapeake Arts Center: 194 Hammonds Lane, Brooklyn Park, Md. 21225 410-636-6597. Chesapeake Music Hall: The area’s premiere dinner theatre features a delicious buffet and quality Broadway-style shows that are certain to make a memorable evening. 339 Busch’s Frontage Road, 800-406-0306 or 410-626-7515. Maryland Federation of Art Gallery: Original fine art in all media by local and regional artists. 18 State Circle, 410-685-0300. Maryland Hall for the Creative Arts: Maryland Hall offers chorale, opera, symphony orchestra, and ballet theatre, as well as classes in the performing and visual arts from beginner to advanced. The AIR and Cardinal Galleries exhibit local and regional contemporary art. 801 Chase Street, 410-263-5544. McBride Gallery: Annapolis’ largest art gallery features seven rooms of original paintings, sculpture, and fine graphics viewed in a historic colonial home. Enjoy landscape, wildlife, still life and nautical scenes. 215 Main Street, 410-267-7077. Mitchell Art Gallery: The museum quality exhibitions at St. John’s College’s gallery change regularly. Also offering gallery talks and tours and children’s programs. St. John’s College. 60 College Avenue, Annapolis, Md. 21401 410-626-2556. Rams Head Tavern & Fordham Brewing Co.: Annapolis’ only restaurant, micro-brewery, and national entertainment showcase. 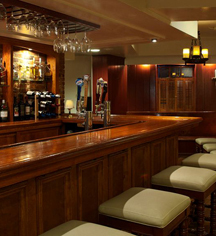 The English-styled pub offers a memorable evening of casually elegant dining and live entertainment. 33 West Street, 410-268-4545. The Talent Machine Company: This performing arts company for youths aged 5-19 has shows directed and choreographed by adults with professional Broadway and stage experience. The company offers high quality family entertainment during the summer and Christmas seasons. (410) 956-0512. Chesapeake Children’s Museum: Hands-on fun for children of all ages featuring interactive exhibits. 25 Silopanna Road, 410-990-1993. Medieval Times Dinner & Tournament: Medieval Times offers an exciting adventure from the Middle Ages set in an 11th century-style castle. Feast on a four-course meal while watching spectacular pageantry, exquisite horsemanship, and an authentic medieval jousting tournament. 7000 Arundel Mills Circle, Hanover, MD, 443-755-0011. Pirate Adventures on the Chesapeake: Let your child enjoy life as a pirate while you relax and enjoy the ride. Kids get their faces painted, dress up in pirate garb, fire water cannons and more! Severna Park, Md., 443-398-6270. YWCA Camp Letts: YWCA Camp Letts, an educational retreat center on the Rhode River, features equestrian, team-building, corporate retreats, overnight lodging, and waterfront activities. Edgewater, Md., 410-919-1418. Atlantic Golf at South River: Edgewater, Md., 443-951-2000. Compass Pointe Golf Course: Compass Pointe is a 36-hole golf facility designed by award-winning architect Lindsay Ervin. When complete, Compass Pointe will have four nines, North, South, East and West. The first 18 holes—the North and West Nines—open Fall 2003. The remaining 18 holes—the South and East Nines—open in 2004. Pasadena, Md., 410-255-7764. Renditions Golf Course: Renditions - a daily fee golf course featuring “Golf’s Grand Slam Experience.” Play replicas of golf holes that have hosted one or more of golf’s four major championships. Davidsonville, Md., 410-798-9798. Annapolis Tours: Three Centuries Tours offers walking tours conducted by guides in colonial attire. Discover the history of Annapolis and the traditions of the United States Naval Academy. 48 Maryland Avenue, 410-263-5401. Discover Annapolis Tours: Enjoy a fun tour in a climate-controlled mini-coach! Friendly guides describe Annapolis waterfront, history, architecture, folklore and trivia. 410-626-6000. Ghosts of Annapolis Tours: Let Ghosts of Annapolis Tours show you what happens when the sun goes down! Haunted houses, restless spirits, and scary tales abound on a guided Ghost Walk or Haunted Pub Crawl. The ghosts of Joe Morgue, Thomas Dance, and the Headless Man are dying to meet you. 92 Maryland Avenue, 410-263-9686. Helen Avalynne Tawes Garden: This six acre botanical garden features representations of Maryland’s natural communities, including a western Maryland forest, a stream-side environment, and an Eastern Shore peninsula. Tawes State office building, Taylor Avenue, 410-260-8189. Heritage Tours: Escorted day and evening tours via air-conditioned motorcoaches to Washington, D.C., and Baltimore’s Inner Harbor. Departures daily April-October. 768 Cecil Avenue, Millersville, Md., 410-923-2771. Historic Annapolis Foundation Walking Tours: Offering two self-guided walking tours, “Historic Annapolis Walk with Walter Cronkite” and the “African American Heritage Walking Tour.” Historic Annapolis Foundation Museum Store, 77 Main Street, 410-268-5576. Legacy Promotions African American Tours: Provides guided African American walking tours through the city of Annapolis. Tours include over three centuries of African Americans in religion, politics, education, military service, civic and fraternal service. 410-863-8878. U.S. Naval Academy Armel-Leftwich Visitor Center: Guided walking tours of the Naval Academy leave from the Visitor Center and include Bancroft Hall, home of the brigade of Midshipmen; the US Naval Academy Chapel, the cathedral of the Navy; and the crypt of John Paul Jones, a famous Revolutionary War naval hero. 52 King George Street, 410-263-6933. Passport Voyages: Baltimore’s newest attraction, Passport Voyages, is a movie ride that transports you through time and space and even the ocean! Located adjacent to the National Aquarium at Baltimore’s beautiful Inner Harbor.1621 E. Pratt Street, Suite 110, Baltimore, Md., 410-468-0700. Project Liberty Ship: The SS John W. Brown is a restored Liberty Ship operated as a living memorial museum. Offering living history day trips on the Bay. Pier 1, 2000 South Clinton Street, Baltimore, MD, 410-558-0646. Living history cruise tickets are available by calling 410-558-0164. Schooner Woodwind: A 74-foot classic wooden sailing yacht, the Woodwind was designed for the Chesapeake to provide exciting two-hour sails. 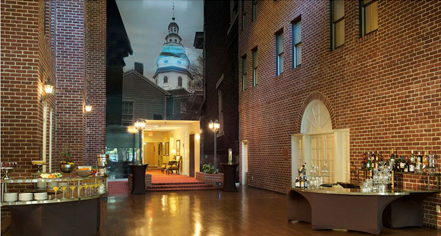 Annapolis Marriott Hotel, 80 Compromise Street, 410-263-7837. Three Centuries Tours of Annapolis: Comprehensive destination management and tour planning. Naval Academy and Historic District tours, concierge and reception services, meeting facilities, meals, ground transportation, cruises, colonial theme dinners, accommodations and spouse programs. 48 Maryland Avenue, 410-263-5401. Watermark Cruises: 40- and 90-minute narrated boat tours and “Day on the Bay” excursions to St. Michaels, Rock Hall, and Baltimore leave from the Annapolis Harbor. 410-268-7600. The Banneker-Douglass Museum of African-American Life and History: Museum of African American history and culture with changing exhibits, lectures, films, tours and educational programs. 84 Franklin Street, 410-216-6180. Benson Hammond House: Early 19th century farmhouse built by Thomas Benson that is listed on the National Register of Historic Places. Contains four period rooms, a museum and museum shop. Linthicum, Md., 410-768-9518. Charles Carroll House: Home of Charles Carroll, the only Catholic to sign the Declaration of Independence and one of the wealthiest men in colonial America. 107 Duke of Gloucester Street, (410) 269-1737. Chase-Lloyd House: Georgian mansion built in 1769 by Samuel Chase, a signer of the Declaration of Independence. 22 Maryland Avenue, 410-263-2723. City Dock: Colonial port once surrounded by warehouses, a ship carpenter’s lot, and taverns. Present site of a waterfront park, the headquarters of the Harbor Master and visitors information booth. Government House: Official residence of the Governor that was built during the Victorian period and offering a collection of Maryland antiques. State Circle, 410-974-3531. Hammond-Harwood House: This pre-Revolutionary War-era residence is a Georgian masterpiece that provides an interesting perspective on Annapolis history. Displaying family furnishings, exquisite pieces by local cabinetmaker John Shaw, fine Peale family portraiture, and a beautiful garden setting. 19 Maryland Avenue, 410-269-1714. Historic Annapolis Foundation–Shiplap House: One of the oldest houses in Annapolis, built around 1715. Formerly a shop that catered to a colonial waterfront clientele. 18 Pinkney Street, 410-267-7619. Historic Baldwin Hall: A local treasure, built in 1861, with hardwood floors, lofty ceilings, and beautiful arched windows. Perfect for receptions, seminars, luncheons or other special celebrations. Millersville, Md., 410-923-3438. Historic London Town and Gardens: This National Historic Landmark on the South River, only minutes from Annapolis, offers a dramatic waterfront setting with eight acres of woodland gardens. Archaeological digs on an ongoing basis. Edgewater, Md. 410-222-1919. Kunta Kinte–Alex Haley Foundation: The Kunta Kinte–Alex Haley Foundation supports development initiatives for the Kunta Kinte–Alex Haley Memorial located at the City Dock in Annapolis. The Foundation encourages greater study and awareness of African American culture, history, and genealogy, and supports the research of family heritage among Americans of all ethnic origins. 31 Old Solomons Island Road, 410-841-6920. Maryland State Archives: The historical agency and permanent records repository for the State of Maryland has a public search room for family history and historical research. Collections include original public records, church records, newspapers, photographs and maps. Hall of Records, 350 Rowe Boulevard, 410-260-6400.